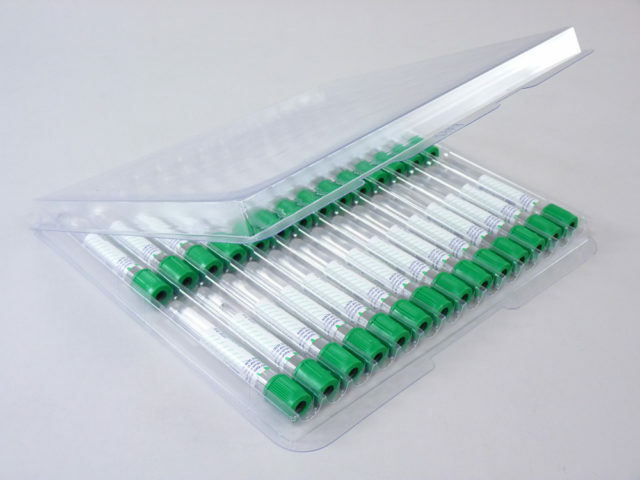 This high clarity plastic PVC tube holder accommodates 28 tubes with tube dimensions ranging up to 13 x 100 mm. Molded cavities hold tubes securely in place for transport or storage and are also compatible with tubes which have a ‘Safety Stopper’. Ideal for storage of tubes in vertical position or horizontal position in both refrigerators and freezers. Assembled size of one tube rack is 10.5 x 10 x 0.625″. 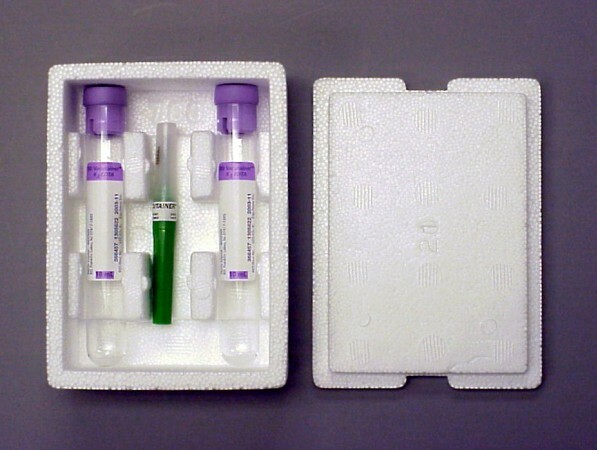 This two-tube holder protects fragile specimens or evacuated blood tubes on outbound and inbound shipments. Ideal for inclusion in applications concerning clinical trial specimen tube transport or DUI substance abuse test kits where glass fabricated tubes with gray stopper plugs are used and require protection. Holds tube sizes up to 16 x 100 mm. Constructed of EPS, this three tube holder protects fragile specimens and evacuated blood tubes on outbound and inbound shipments. 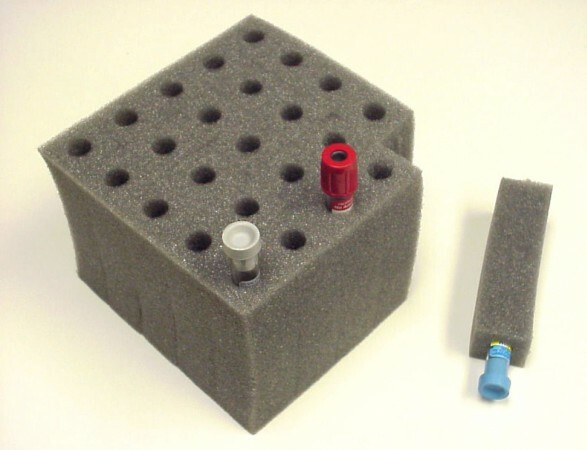 A foam lid sits tightly over tubes to provide an insulated transport environment. Holds tube sizes up to 16 x 100 mm. The TearTech® 25 hole foam rack is a versatile tube transport system that provides cushioning and protection for blood tubes, urinalysis tubes and many other commonly transported test tubes. The die-cut construction allows users to tear-away any number of tube holes for transporting from 1 to 25 tubes. This allows the user to customize the transport payload day to day for all tube transport needs when sending specimens within a courier network or via common carriers for subsequent laboratory testing. Combine with Therapak ambient kit boxes, insulated shippers (refrigerated and frozen), specimen bags and absorbent material to complete the specimen shipping requirements. TearTech® 25 hole foam racks are available in case quantities as an individual item or with a 13 x 18″ specimen bag with absorbent for direct placement into common insulated shippers (see 56519 Small Insulated Shipper). Overall foam block size is 150 mm x 150 mm x 100 mm.